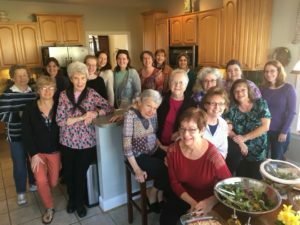 The Women’s Fellowship Ministry exists to bring women of all ages and in all seasons of life together to grow in their relationship with Christ through teaching, encouraging, mentoring, fostering fellowship, and serving Christ in the home, church, and community. Get connected with newsletters by emailing us. We also have a Facebook page for connecting digitally for prayer and support and communication. Women’s Morning Bible Study: A new study is starting up on Thursday mornings from 9:30 am to 11 am in the Church Kitchen. The book being used is “Revelation, The Triumph of Christ” by John Stott. This is a 12 week Bible study on the book of Revelation with commentary by John Stott. Contact Betsy Ilderton or Coral Westfall for more information. Women’s Evening Bible Study: A new study will begin on February 7, 2019 and continue through April 7th, every Thursday from 6 pm – 7:30 pm in the Church kitchen. This is a 10 week video study, entitled “God of Covenant” by Jen Wilkin. The study covers Genesis 12-50, exploring the fathers of our faith and how God works everything together for His glory and our good. The book is available for purchase at www.lifeway.com. Contact Pat Vida if you have any questions. 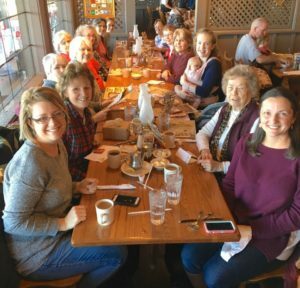 Women’s Sunday School Class: Join us for discussions arising from a fascinating book by Julie Zine Coleman, called “Unexpected Love.” God’s heart is revealed in Jesus’ conversations with women. The book provides an in-depth look into each scripture where Jesus is meeting, talking with a woman in need. To see how Jesus deals with various women and their need has been eye opening for us! We have two more women to meet in this book – each encounter takes us 2 or 3 weeks to cover. When we finish “Unexpected Love”, we are looking into using a Lenten Study similar to the Advent Study. We meet in the kitchen and begin about 10:00 am finishing about 10:45. In the Lenten Study, the leadership will be shared. 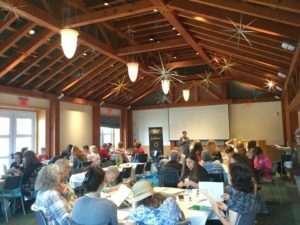 Women and girls ages 14 and up are invited to attend all WFM events. Nursing babies may attend with their mothers. The WFM assists in hosting baby and bridal showers, as well as organizing meal deliveries for those in need. Please contact us for more information!